Please contact us for more order information or for discounts for bulk orders or for discounts for educational institutions. More information is at the Plastic Macca blog. Watch promo video/ book trailer here. Tina Foster has been researching the history of doubles in intelligence psychological operations since 2008. 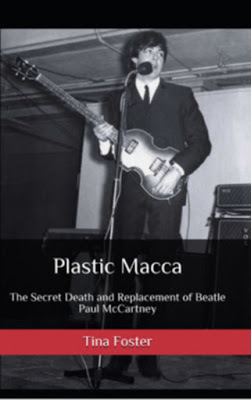 Tina has published many related articles on her popular blog, Plastic Macca. She has also been a guest on numerous radio shows, and is considered to be an expert in the field. "Just read the first 50 pages of your book. I think its great - thanks for referencing me too on p.10. It's by far the best book on the McCartney conspiracy I've read." "A completely compelling and thorough study of all available clues and other evidence pointing to this tragic truth. And hints pointing towards an even deeper truth that all four were replaced before the Sgt Pepper album. A highly recommended work which goes well with the works of the late Dave McGowan, and bravely goes where he didn’t for whatever reason... A shining light in this world of dark deception." "I’m still in the middle of reading it so I’ll get back to a comment on it when I’m finished, however, so far, it’s very informative. Laid out as a bevy of scenarios of how and when the obvious differences are between Paul and Faul, the reader is armed with case and point of these discrepancies and when they occur. So, do I recommend this book? By all means YES!" "Great detailed facts and information... clearly written, easy to understand and follow with documentation to back up claims." Copyright © 2017 Cynthia Hodges, Esq. All Rights Reserved.